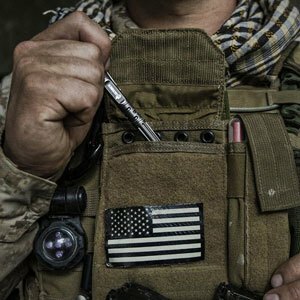 Having the best tactical pen on you in a critical moment may mean the difference between life and death. These days, you never can be too sure when violence might erupt. One second everything seems fine, and then in the next, your life may be in grave danger. 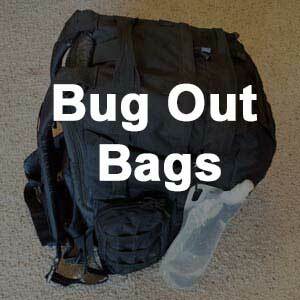 There are products made for self defense out there that can help turn the tide in our favor. They give us that extra edge over the bad guys. 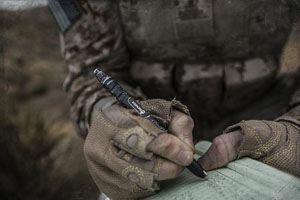 The tactical pen is a great innovation that can put a readymade weapon in your hands while also looking harmless before it is put into action. 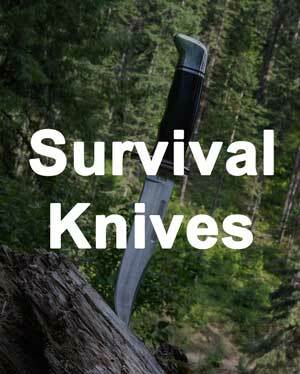 It's a great solution for those times when you don't have a firearm or a knife for self defense. It's time to win back control over bad situations and circumstances. 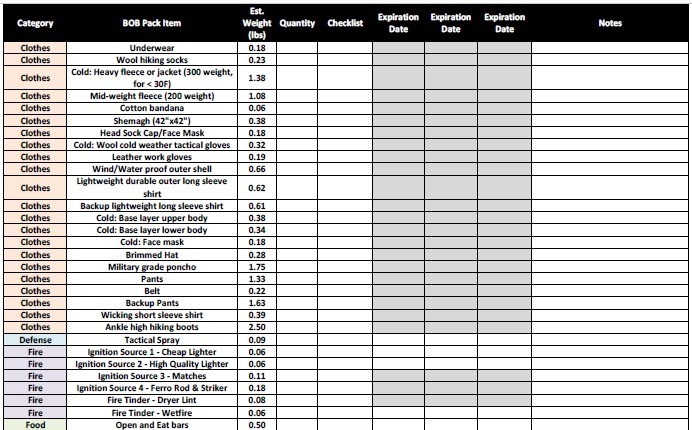 In this article, we are going to look at the top options that should be included in your line up of t﻿﻿actic﻿﻿al gear. Let's take a quick look at our comparison table to see how the top ones stack up. Next, let's dive into the main features that you should look for when making a decision. 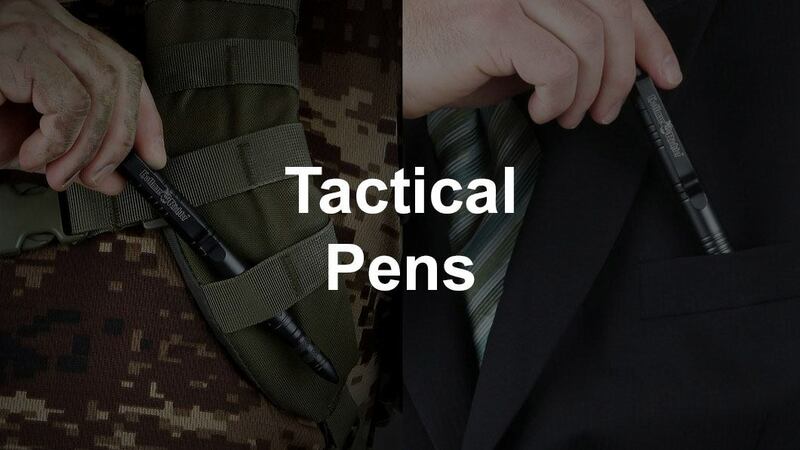 When it comes to buying a tactical pen, you want to get the best value for your money. That is why we are going to look at the key features to consider when choosing your pen. It's obvious that we want a pen that is made out of metal so that it can be used as a stabbing weapon. The question then becomes what type of metal is best? There are a few choices available, with the main two being Steel or Aluminum. Both metals are strong enough for the job, and so the key thing here is going to be weight. Steel is heavier than Aluminum. So if light weight is one of your main care abouts, you should definitely go for the Aluminum. You can shave off about an ounce when compared to a Steel pen. However, there are different grades of Aluminum. Often, you will see something called "aircraft grade Aluminum", which is usually just a buzz word used for marketing. A common Aluminum alloy found in these products is 6061, which includes Magnesium and Silicon. 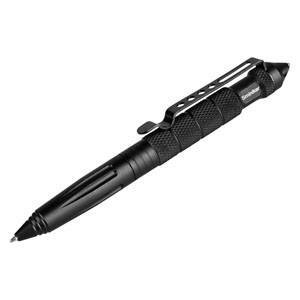 If you plan on using the device as both a self defense weapon, as well as a writing tool, then you should consider what type of refills the pen will take. The type of refill should match your pen style preference: fine, medium, or broad. There's no point in wanting a usable pen, but hating to write with it. Spend some time here to consider what type of pens you normally use every day and enjoy. Another factor is how expensive are the refills and how long do they last? A cheap pen that eats expensive refills fast becomes a very expensive pen when you do the math on buying refills for it. The typical refills are often called Parker for the branding. Some favorite style refills are the Rite in the Rain and Space Pen refills that are just a tad shorter than the Parker style. Usually, a small plastic adapter piece is needed for these to fit in Parker able pen types. Don't worry, this adapter is often included, but always confirm before you buy. Some pens come with a glass breaker as part of the design. It's a good idea to evaluate if this feature is something that you require. Typically, the glass breaker end will be carbide or some other strong material. 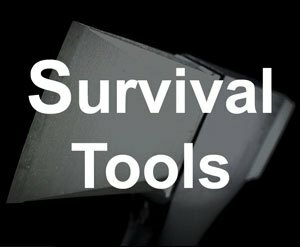 If you are in a vehicle a lot, or will be around situations where you might have to rescue people, then this might be something worth having as a backup. The Gerber Impromptu is one of the top sellers for this type of product. It's rugged, machined steel body means that it's plenty tough. A stainless steel clip keeps it handy and ready to deploy for writing or fighting. What makes this one stand out is its reliable push button design. Many pens of this nature are twist instead. The weight of the pen is 2.25 ounces, due to the steel construction. There is an integrated glass breaker tip, if that feature is important to you. The pen comes with an awesome Rite in the Rain ink cartridge that is a stellar performer. It takes the same type of refills, or can also handle the more common types as well. The Space pen refills fit too, which is an added bonus. The pen is a little over 5 inches and fits comfortably in the hand. The added weight from the steel construction will tire the hand out over prolonged use, but isn't a big issue for normal writing. 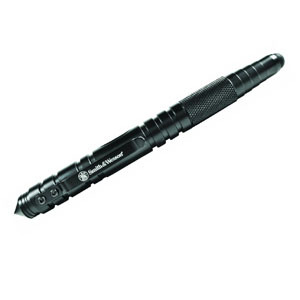 Gerber collaborated with law enforcement professionals on the design of this pen, and the result is obvious. The pen excels as both a robust writing device, and a fall back self defense weapon. If you have the money and the extra ounce of weight is not an issue, this is your absolute best choice to go with. If you are looking for a cheaper and lighter weight option, then the SWPENMPBK is a fantastic choice. It's machined 6061 Aluminum body makes it extremely tough, while also light at only 1.4 ounces. The pen has the writeable tip at one end and the tactical strike tip at the other end. There is a pop off cap that can fit on both ends. A lanyard hole is on the pop cap just in case you want to better secure the item. There is a coarse area for better grip of the pen. The style looks great and most people don't know that it's more than a pen by just looking at it. 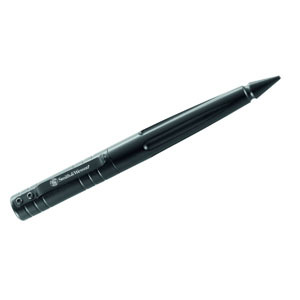 If you need a pen that has a much better grip with outlined grooves, the SWPENMP2BK is the way to go. Like the other Smith and Wesson, this pen is made out of machined 6061 Aluminum, making it strong and light. Given the better grip capability, this pen looks pretty mean and probably won't pass as an innocent pen. If you are not worried about the stealthy look of your tactical tool, then the added benefit of this grip is worth it. The Hoffman Richter Stinger is a pen that combines essential functionality with style. Whether you're out in the field, or stuck in the office, this pen goes with everything. It sports an Aluminum body that is coated with Titanium, giving it that little extra refined ruggedness. The cap style is similar to the two mentioned before where the tactical end is always exposed, and a pop cap covers the writing end. If you're on a tight budget, you won't want to miss the Sminiker Defender. While it has all of the features of a great pen, the price is pretty darn amazing. It has an Aluminum alloy body for sturdiness with a strong clip. There is a carbide glass breaker at one end, and the ink side at the other. The pen style is a twister, which means you twist it to get the ink end to come out for writing. If you are looking for a little different style, then the SWPEN3BK is another great option from Smith and Wesson. 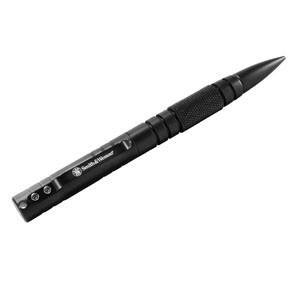 It is a combination of a pen, stylus, and tactical striker. The device normally has the striking end and stylus exposed at both ends. A screw cap, which has the stylus on the end of it, is removable which exposes the writing end and can be attached to cover up the striking end. The materials are top notch and exactly what you would expect from Smith and Wesson. If you want a lighter look, check out the Schrade SCPENBK. It looks like a fancy pen with somewhat of a point at the end. The pen is made out of sturdy Aluminum, and has a ridged design to give it some strength. A screw cap covers the writing end of the pen, and it takes the standard Parker style refills. 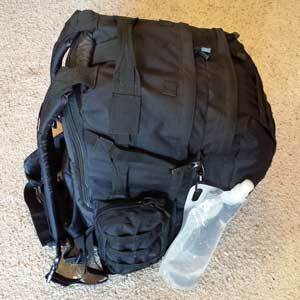 Another elegant and discrete solution is the Pocket Partners Practical. 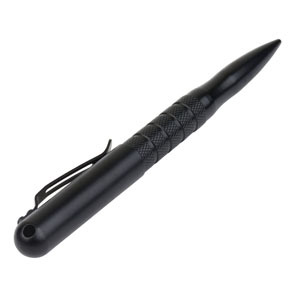 The use of the pen as a tactical device is not overly obvious, given the design. A screw cap covers the writing end, and is easily removed. The cap can be popped onto the tactical end while writing for more convenience. This pen is one of the lightest options that made our list. Another great option from Smith and Wesson is the SWPENBK. It has a fluted design style machined out of Aluminum. 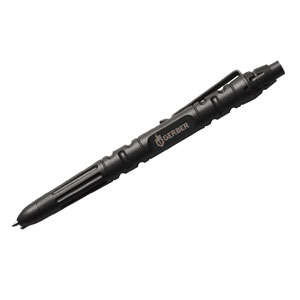 The twist cap on this pen can be unscrewed to expose the writing end, or even popped on the tactical end while writing. The quality, sturdy clip, and style of this pen makes it a great option if you want Smith and Wesson quality for a lower price. If you want a slightly different look and feel, then consider the Off-Grid Tactical Bodyguard. Its Aluminum design has very deep grooves to give you a lot more grip on the pen in tactical situations. The pop off cap covers the ink end, while the tactical end is normally exposed. The pen definitely looks tactical, so it won't be flying under most people's radar. In conclusion, we talked about how a tactical pen is a nice self defense device that you can typically carry on you at all times. 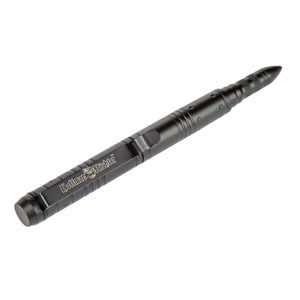 It doubles as both a writing utensil as well as a tactical tool. We looked at the many different factors that you should consider in making your selection. From the metal type used, weight, and design, it is important to think through the many different features that you want in an item of this nature. Consider also whether or not you want a stealthy option that looks harmless to the majority of people, but can be quickly deployed if a threat to your security pops up. Some pens have twist caps while others have pop caps. 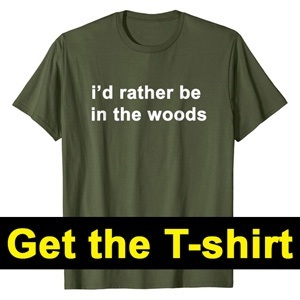 A lot of this comes down to preference. You should also consider the pen style, and whether the writing end is always out, twists out, or pops out. Keep in mind that these type of pens have become very popular in the last few years, that a bigger portion of the population is aware of their existence now. What this means for you is that you need to make sure that the places you visit allow devices like this. Always be aware of your federal, state, and local laws, and make sure you follow them. Also, the use of this pen has the ability to hurt, maim, or kill someone. Consider studying the laws on self defense, and the rules on scaling force. Your safety is obviously paramount, but there are always consequences and repercussions of employing any type of weapon in any situation. Study ahead of time so that you know what your rights are for self defense, and so that you can obey the law. Many people ask if these pens are allowed for flying by the TSA. Typically, the answer is it depends on the agent at the check point. By now, these pens usually get confiscated, so you'll want to be aware of the implications if you take this to the airport. Here are the official TSA rules. 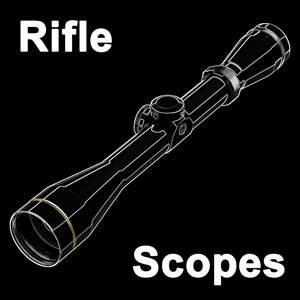 With that said, these pens are great tactical tools that can help give you an edge in defending yourself.